Meet us under the Dome! Welcome the holidays with Festival of Trees Under the Dome for a fresh take on fun. Spirits soar under a 90’ ceiling with Holiday Tree competition, craft beer tasting, and the Tennies & Ties Gala. The weekend brings musicians and dancers, artisans and quilters, gifts, sporting games, Tom Pesce’s Saturday Magic, famous characters, amazing raffles. Festival has it all and only needs YOU! 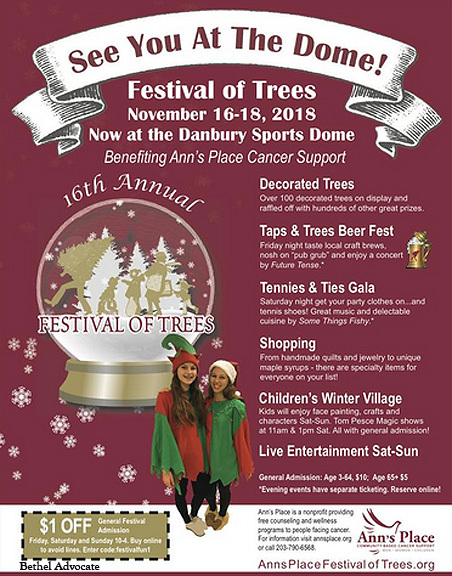 Come help create the miracle of hope & comfort for our neighbors living with cancer by sponsoring, volunteering and attending Festival of Trees at the Danbury Sports Dome! DONATE: You bring Festival to life by being a sponsor, buying a tribute or business ad, buying admission and raffle tickets, and donating labor and materials. There would simply be no Festival without you! Thank you for being generous. GET INVOLVED: There are many ways to join Festival: be an Elf; donate a tree or raffle prize; become a vendor; or volunteer your time, talent, expertise, or labor. Help with planning, lend equipment, and attend! MISSION: Ann’s Place provides help and hope to individuals and their loved ones living with cancer with a host of free professional services aimed at improving quality of life during and after cancer. Festival of Trees General Admission: Adults & Kids: $10, Seniors: $5, Under 3: Free.